The park could be perfect for your next fishing holiday. The area to the east of Snowdonia, bordering the English county of Shropshire, is one of Wales' best kept secrets. Wonderful countryside, wooded hills, tranquil valleys and the Berwyn Mountains offer tremendous scope for walking, cycling, climbing and birdwatching, and a fantastic base in this area is the village of Llangynog. Llangynog has two pubs which serve food, and is within easy reach of both Bala, with its famous lake and waterports facilities, and Lake Vyrnwy, a renowned beauty spot with the added bonus of good fishing. Mid and north Wales, and the rolling Shropshire countryside are all within an easy drive. The area to the east of Snowdonia, bordering the English county of Shropshire, is one of Wales' best kept secrets. Wonderful countryside, wooded hills, tranquil valleys and the Berwyn Mountains offer tremendous scope for walking, cycling, climbing and birdwatching, and a fantastic base in this area is the village of Llangynog. Llangynog has two pubs which serve food, and is within easy reach of both Bala, with its famous lake and waterports facilities, and Lake Vyrnwy, a renowned beauty spot with the added bonus of good fishing. Mid and north Wales, and the rolling Shropshire countryside are all within an easy drive. Rivers Nest offers the following facilities. Full electric central heating. Electric oven and hob, microwave, fridge, washer/dryer, flat screen colour TV, DVD, CD/radio, iPod dock with speakers,WiFi broadband available. All fuel and power inc. in rent. Bed linen and towels inc. in rent. Off road parking for 1 car. 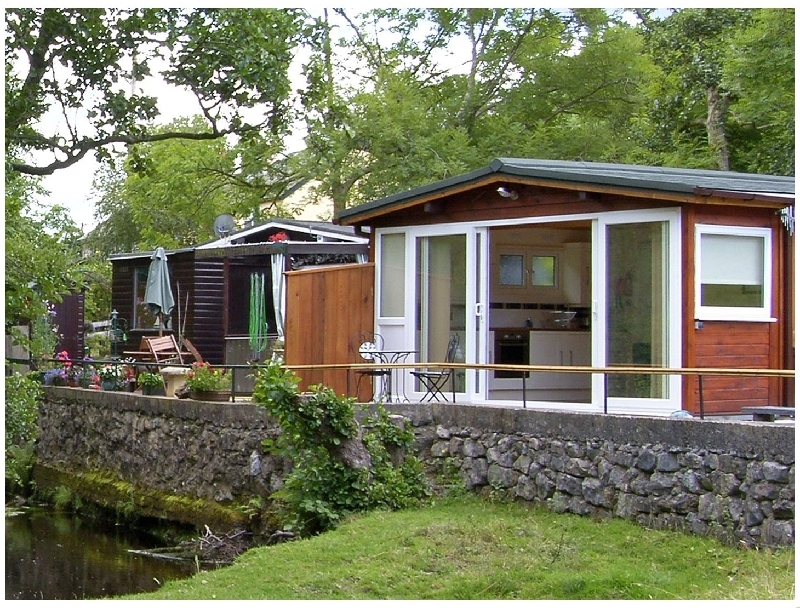 Decked terrace area with garden furniture and separate patio overlooking the River Tanat. Sorry, no pets and no smoking. Shop 2.5 miles. Two pubs serving food 2 mins walk. Note: This property is unsuitable for children. A delightful, detached, cedar wood cabin, one of a group of nine, quietly situated at the head of the River Tanat, in the pretty village of Llangynog. Offering quality, contemporary accommodation, surrounded by the Berwyn Mountains, and boasting stunning riverside views, this Llangynog self catering cottage makes the perfect romantic getaway. Enjoy watching the sunset from this glass fronted cottage, or enjoy the stunning views from the decked terrace, while dining al fresco after a busy day exploring. This Llangynog cottage is an hour from the magnificent beaches of the Cambrian coast, and a short distance from the start of the Snowdonia National Park. The active will enjoy the walking, cycling, fishing and watersports in the region, while everyone else will love simply unwinding by the riverside and pottering around the lovely local area. So, if you are looking for quality holiday accommodation in Wales, within easy reach of the fabulous Pistyll Rhaedr waterfall and Lake Vyrnwy, then this Llangynog cottage is the perfect place for you. All ground floor. One double bedroom with king-size bed. Shower room with shower, basin and WC. Open plan living area with fitted kitchen, dining area and lounge area with picture windows overlooking the River Tanat. Have you been to Rivers Nest? Please submit your review so that others can benefit from your experience. Important note: Information provided here about Rivers Nest is based on our best knowledge. However, please check with Rivers Nest before booking to ensure that you have the information required. Reviews are the sole views of the contributor and do not necessarily represent the views of CampsitesandCaravanParks.com or Rivers Nest.